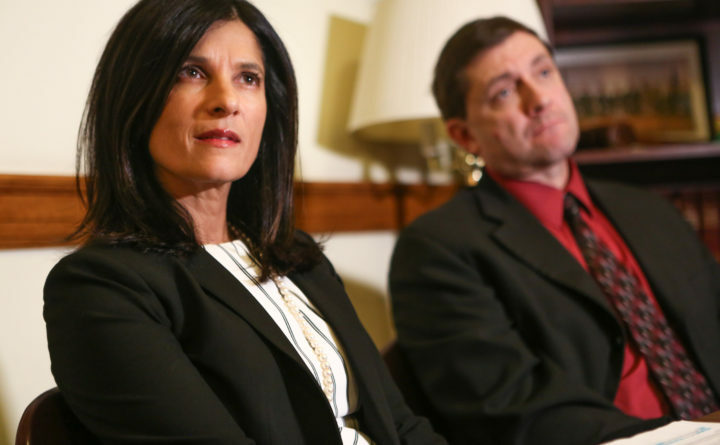 House Speaker Sara Gideon, D-Freeport, and Troy Jackson, D-Allagash, react to Governor Paul LePage's final State of the State address before a joint session of the Maine Legislature in Augusta, Feb. 13, 2018. Gideon, a Freeport Democrat, clashed often with the Republican governor during her first term as speaker, stoking partisan gridlock that produced the first state government shutdown in 26 years in 2017. An equally rancorous regular legislative session earlier this year adjourned with a pile of unfinished business on key matters and basic functions. That spurred a special session that dragged through the summer, blowing through the legislative budget and leaving most lawmakers frustrated by the House’s inability to achieve compromises on issues already settled in the Senate and by deep animosity that marked many House floor debates. At times, the partisan stalemate got personal, triggering inflamed rhetoric and name-calling, such as in April of this year, when a frustrated Gideon accused LePage and House Republicans of legislative “terrorism.” She later apologized. But LePage will leave office in less than a month and House Minority Leader Ken Fredette, the Newport Republican whose caucus held firm with LePage despite pressure from Gideon and Senate leaders, has already left. The prospect of State House life without her chief foils makes Gideon optimistic. “There’s a lightness in the air, and it’s not just among Democrats,” the 47-year-old said Thursday, a day after new legislators took the oath of office. Gideon’s virtually uncontested path to a second term as speaker is partly due to Maine’s blue wave last month that ejected Republicans from every meaningful leadership position in state government. Mainers elected Attorney General Janet Mills, a Democrat, to succeed LePage, and Democrats won 110 of 186 legislative seats, reclaiming control of the House and Senate. On Wednesday, Democrats flexed their new power and placed party members in all three constitutional offices — Rep. Aaron Frey, D-Bangor, was chosen to succeed Mills as attorney general; Henry Beck, an attorney and former lawmaker from Waterville, will serve as treasurer; and Matt Dunlap won a fourth consecutive term as secretary of state — his last before he terms out in 2020. Sen. Troy Jackson, D-Allagash, last session’s Senate minority leader, was chosen to replace Sen. Mike Thibodeau, R-Winterport, as Senate president. Jackson and Gideon said recently that the 129th Legislature brings potential for bipartisan deal-making that hasn’t come in almost a decade. LePage’s impending departure and an entirely new team of Republican legislative leaders create the opportunity to minimize political infighting and move past the testy, dysfunctional relationship with the controversial governor that, at best, bred a perfunctory partnership, and at worst, hostility and disrespect that trickled-down to partisan gridlock, they said. LePage used his veto pen — complemented by a loyal Republican minority in the House that stuck with him to prevent Democrats from winning the two-thirds majority votes needed to override vetoes — effectively to stifle Democrats’ policy agenda and punish individual lawmakers, including Gideon and Jackson, who incurred his ire. During his eight years, LePage vetoed more bills than all previous Maine governors combined during the past century. Jackson, 50, said the expected removal of LePage’s “veto threat” that hovered over almost “every single bill,” simply because “he doesn’t like you, it’s a bad day and this person looked at him wrong,” will make a big difference. Gideon and Jackson hope that, during the next two years, they can help corral bipartisan support in some key areas, including state-funded initiatives for rural broadband networks, finding equitable ways for communities to pursue a local option sales tax if that’s what they want, and continuing to forge bipartisan agreements on mitigating the state’s opioid crisis. Jackson also wants to push forward with student debt reform by establishing a program that incentivizes Maine and out-of-state students to attend one of the state’s higher education institutions in exchange for college loan debt relief if those students stay and enter Maine’s workforce. He also wants to establish a Medicaid buy-in option, allowing low-income Mainers access to affordable health care, and to build a prescription drug importation program that gives patients and local pharmacies access to purchase prescription medicine at a much lower cost from non-U.S. pharmaceutical companies in places like Canada, Australia and New Zealand. When he was out of the Legislature after an unsuccessful bid for the Democrats’ nomination in the 2014 2nd Congressional District, Jackson worked for the Great British Drug Store, an overseas prescription company whose work in Maine was thwarted by a federal judge’s ruling. “There’s no reason why Republicans and Democrats, urban and rural, can’t work on these things together,” Jackson said.